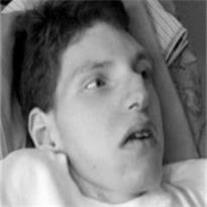 Justin Vance Lemos, 21, Born Feb. 16, 1988 at St. Joe’s, PHX, Passed Nov. 3, 2009 at St. Joe’s, PHX. Preceded: Bro-Patrick V. Lemos. Surviving: Parents-Vance & Gina Lemos, Sis-Rachael & Mark Ridley (Eliza, Alan, Rhiannon & Layne), Grandparents Martin. We will miss him immensely. It was an honor to know this Beautiful Boy. Justin’s life work was to teach joy & be an example of courage. Justin loved his Mr. Frog, Charlie Brown & the Peanuts Gang, & listening to music. Services Sat., Nov. 7, 2009, visitation at 9 am, services at 10 am at The LDS Church 1054 W. 2nd Pl., Mesa, AZ. Resting place: Mesa City Cemetery, 1212 N. Center St., Mesa, AZ. Donations to Congenital Heart Foundation. Arrangements by Bunker’s Garden Chapel.